G was in charged of dinner on Saturday, which means meat and potatoes. Dinner was a variety of sausages from Fischer Meats - chicken tarragon, lamb, and eye-talian. 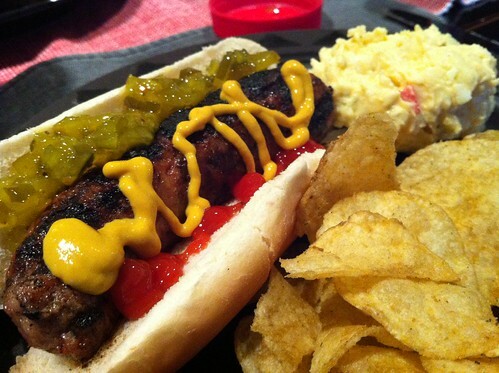 He grilled them simply and served with regular and deviled egg potato salad from the store. I also had some Chicken and Waffles Lays potatoes chips. The consensus was the lamb was real good. The limited editions Lays not so much, they lacked chicken flavor. After a light meal of tube meat and potatoes, we played one round of Settlers of Catan while we wait for the cake to warm up to room temperature. Do you know that moment of regret when you realized you have screwed yourself in the first placements? I was so distracted by the 3:1 port and dodge-the-block from the blue people, that I failed to realize I only have two kinds of resources. Sigh. I deserved to fail. Every year, I look forward to your birthdays. 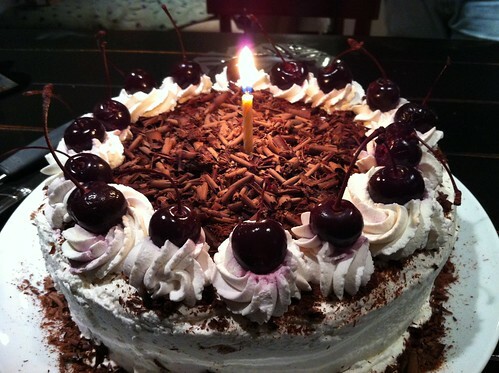 This year, you gave me a couple of options and I chose Black Forest Cake. I rationalized black forest is a less adulterated chocolate cake plus booze, thus a good choice for people who prefers plain chocolate cake. Plus, a trip to the new big box liquor store? why yes. At the big box store, I picked up some Made in Germany Black Forest Kirschwasser. There was two kinds of cherries-in-a-jar. I inquired which the helpful sale person prefers, "these are ok, but if you are making a good martini, go with these." I didn't have the heart to tell him I am only making cake. Traditionally,Kirschwasser (a clear liquor distilled from tart cherries) is added to the cake, although other liquors are also used (such as rum, which is common in Austrian recipes). In the United States, Black Forest cake is most often prepared without alcohol. German statutory interpretation states Kirschwasser as a mandatory ingredient, otherwise the cake is legally not allowed to be marketed as Schwarzwälder Kirschtorte. No wonder I never really liked the black forest cakes I've had. 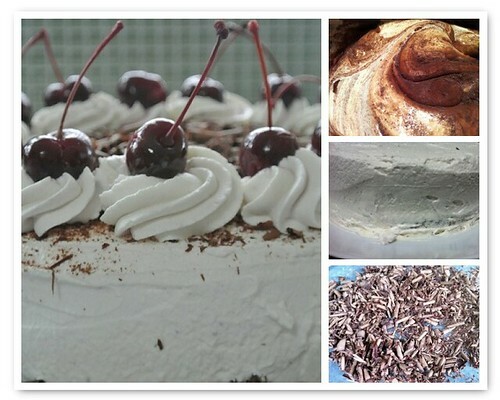 I search around and selected this Hubert Keller Black Forest Cake recipe. I started on Friday night with the cakes. I approached the cake recipe with trepidation. I have never been 100% satisfy with my genoise. This one deflated very rapidly when I was folding in flour and coco. Yikes. It turned out ok, on par with others I made, phew. I did the first assembly step Saturday morning, cake - syrup- whipped cream-cake-syrup-whipped cream. I wanted to give the flavors plenty of time to melt together. I also drained the cherries and macerated them in the kirsch for a few hours before topping the cake. Happy birthday again. And our best wishes. Late last week, N and I had a discussion that went a little like this. J: It's your turn to plan a menu, ok? J: We already had burgers twice this week. J: There's not enough time for me to make and ferment the pizza dough. N: Steaks from the freezer? N: You are not being helpful! 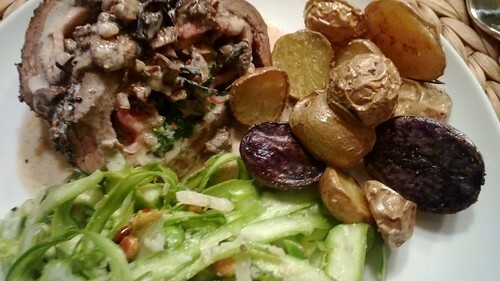 N gave up on me and did some web searching for inspiration and landed on stuffed flank steak. The flank steak was stuffed with bacon instead of prosciutto, spinach instead of arugula, and N added bell peppers to the filling as well. He also made a quick mushroom sauce to go with it. Mm. I made Smitten Kitchen's ribboned raw asparagus salad with lemon to go along with the steak. We also roasted some quick potatoes when you informed us that unfortunately G was not going to make it. As we picked up the flank steak at the butcher, we decided that it wasn't enough meat for four people. 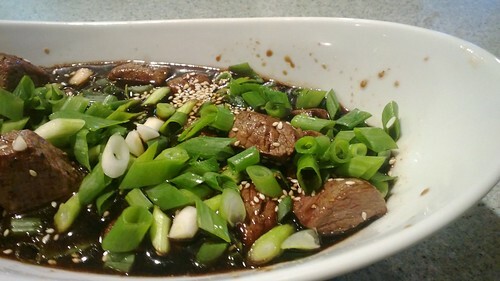 N and I conferred on what to add to the meal and N decided on his version of Daniel's Broiler filet mignon teriyaki steak tips as an appetizer. Yum! After dinner, N wanted to play a simple card game, so we pulled out Nuts! 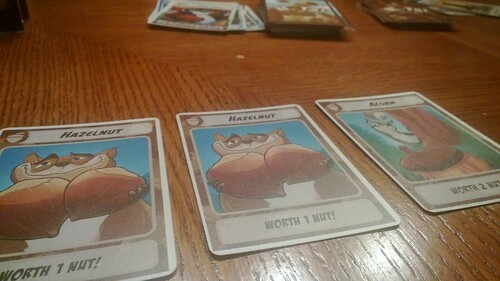 (BGG) Nuts! is sort of juvenile and not in the least bit complicated, but it is an alright filler game. After a 3-player game of Nuts!, we finished off the night with some Uno and dark chocolate pretzels from nuts.com. Mmm pretzels... See you next time! Dear J - It was gorgeous on last Saturday. I took advantage of the weather to do some work Outside - mowed and gave some ferns haircuts. All of which meant our Saturday meal suffered. Not only was it a poorly planned meal, none of the food pictures turned out. Good thing too, since N said no one wants to see what we had for dinner. However, I do have an unrelated picture, a trail for another grill item, for another time. We started with some chicken pate, a repeat. This time, I had to cut a lot of fat and nasties from the liver, so I didn't have the full amount of liver the recipe called for. It was a lighter texture, mousse like. I wanted more chicken wings. Because having chicken wings at Kukai earlier in the week was clearly not enough. I tried this Korean chicken wing sauce recipe. Doesn't taste at all like Stone Korean Restaurant chicken wings. I was not happy with how these turned out.. The flavor was not balanced for grilled wings. That just means I have to try again. More. Chicken. Wings. I also tried spiral cut hot dogs like you do. Fortunately, there are no pictures to show you how poor of a job I did. I agree this technique requires a bigger hotdog. A simple salad, your tots, and store bought potato salad rounded out the meal. Coloretto (BGG link) This little game exceeded my expectation, thus it was 'good'. It is a definitely an end of the night low brain wave game. The art is pretty good, pretty colors. 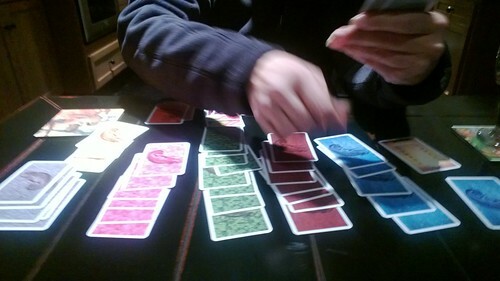 The object of the game is to maximize the number of cards of the same color. The 4th+ colors are negative scores. 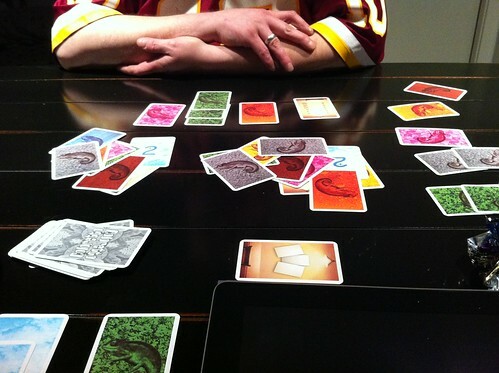 Each player takes turn drawing cards, to place in one of the rows, or the player may take the row. G tried a technique of drawing a lot of cards. I think we agree take the whole stack is not necessary a winning strategy. However, he did win the second game. Even thought there is a lot of luck in this game, which I normally do not enjoy, but it is pretty good for an end of the evening game. But wait, you just found we missed a major rule. We were doing it wrong! We grilled the last two weeks. 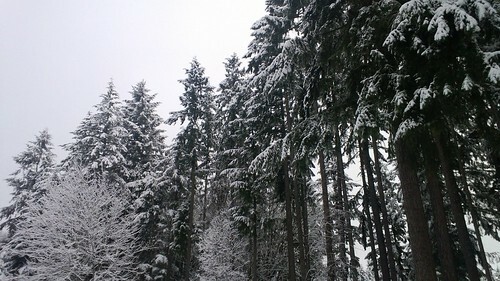 Is spring here? I guess not, since I woke up to this on Friday morning. One step back to winter and away from grilling. Chester didn't get the memo that G was back this week. In the farm share this week, I got two huge bunches of spinach along with a recipe for the Afghan dish Qorma e Sabzi. It's not complicated -- sautéed onion and spinach with some spices. I love Afghan food. My favorite Afghan dish is kadu/kadoo, a delicious braised pumpkin whose sweet taste goes very well with lamb. I wasn't sure how it would go over so I decided against it (thinking about it this morning, I wish I had made it anyway). 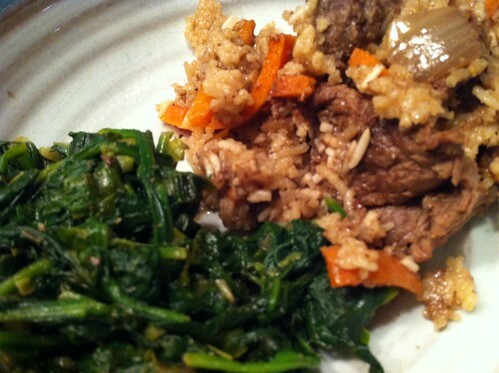 To go with the spinach, I made what is often called the national dish of Afghanistan, qabili pilau. 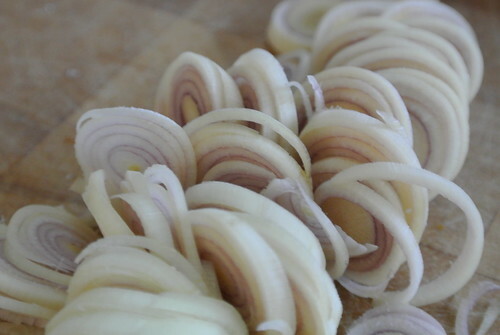 Making the quabili pilau was a dance with the french oven. Sear the meat. Remove the meat. Cook the onions. Add the meat back. Cook. Remove the meat. Sauteé the julienned carrots separately. Add the rice and half of the spices to the main pot. Wait. Add the carrots, meat, and rest of the spices to the pot. Cook. Lots of moving pieces. I was a bit skeptical. I did double the spices and meat and omit the raisins (ahem). It was alright. A hearty meaty pilaf. The farm share has us swimming in apples and pears in addition to spinach. I decided I'd throw together a crumble, my favorite of the pie-cobbler-crumble trifecta. 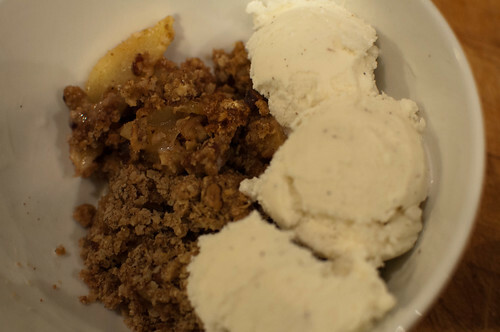 I have my own crumble recipe in my head, but a quick web search handed me this Dave Lieberman recipe. I thought the inclusion of pecans in the crumble topping sounded delicious. I added more apples and only used about 2/3 of the topping since I was using a pan slightly smaller than the recipe-suggested 9x13. It still turned out more dry than I expected, but tasty enough with some vanilla ice cream. 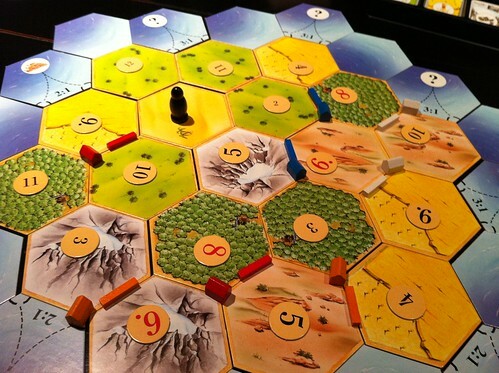 After dinner and dessert and some conversation, we played a round of Settlers of Catan. N kicked our butts. You got blocked in with nowhere to build. I just stopped getting resources despite being built on 6/8 -- all the 7s I was rolling didn't help! G started to catch up but a little too late. Dammit. 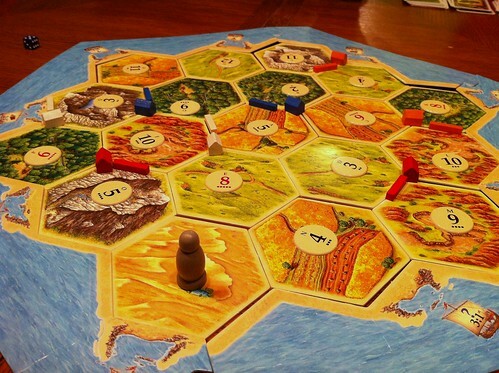 Our Catan board is making me mad.